The strawberry tree grows wild on Sardinia. Itria honey is very special, and stands out due to its white colour, its creaminess and its slightly bitter taste. Itria strawberry-tree honey is a product that contains no colourants or preservatives. Just open the jar and you are sure to be enchanted by its fresh aroma and delicately bitter taste. 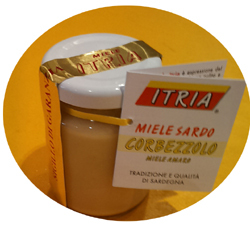 Itria honey is a typical Sardinian product that comes in crystallised form because it is processed at low temperatures, thus conserving all of its original natural properties. Crystallised honey can be liquified by heating it in a bain-marie at a temperature of below 40°C. It can then be poured into the still-warm dish or beverage.